It’s mid-April, and we all know what that means: it’s almost time for the highest of all holidays, April 20 — or as it’s colloquially known among cannabis consumers, 4/20. For cannabis retailers, 4/20 is like Black Friday on steroids. Even typically low-volume stores and dispensaries experience massive influxes of customers on and around the holiday, and with 4/20 falling on a Friday this year, you can bet that it’s going to be a huge, weekend-long event. Naturally, you’re going to want to take advantage of this cannabis retail bonanza. Here we’ll show you how to merchandise your store and ensure that 4/20 is your best business day of the year. From a merchandising strategy perspective, you’ll want to use strategies focused on increasing category sales — and in this case, the sales category is seasonal. A traffic-building strategy, as its name implies, is meant to attract consumers into your store and to a particular aisle or product category. Practically speaking, it means alerting your customers to your amazing 4/20 deals and specials through available advertising and marketing avenues and building relevant product displays with frequently-purchased-together item bundles. You’ll want to start promoting your special deals and savings at least one week ahead of time through your mailing list. You should also start decorating your sales floor and building 4/20 displays a few days in advance to really get customers in the right mindset. Your excitement-creating strategy includes the special, limited-time deals and offers you’ll make. Remember: every cannabis retailer in the country is going to be running deals on 4/20. In other words, there’s a lot of competition. So if you really want to make your dispensary stand out — and stick in the minds of potential repeat customers — you’re going to need to be bold with your offers and deals. For example, a Fort Collins, CO, retailer last year held a raffle drawing every hour for a $1 ounce of flower. Now that’s memorable! Cannabis retail merchandising best practices dictate that product displays should be set up to the right of the entrance and in a counter-clockwise fashion around the store, as this is the path most traveled by customers. This is particularly true for 4/20 when most people are going to be coming in specifically for your specials. Place these product displays in hot-spots around your store that are at eye-level. 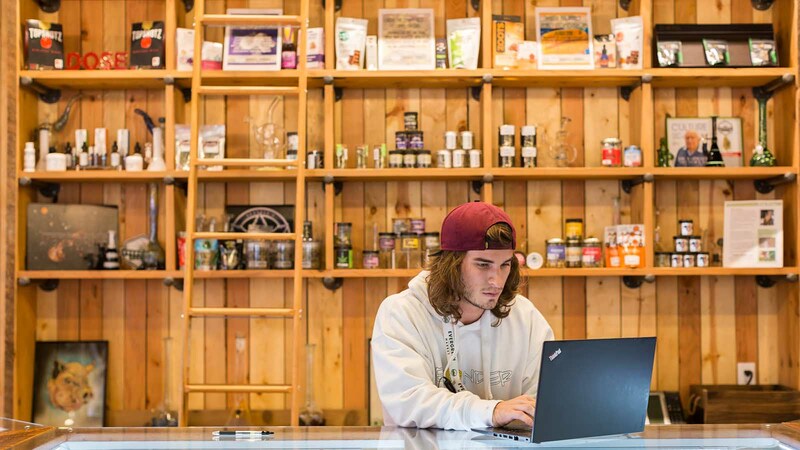 Want to receive more cannabis retail merchandising and marketing tips, tricks, and best practices right in your inbox? Subscribe to our blog and learn how to optimize sales and build a loyal customer base.